Two-stage, match grade performance with legendary Excalibur reliability, introducing the Pro Shot ACP Trigger. 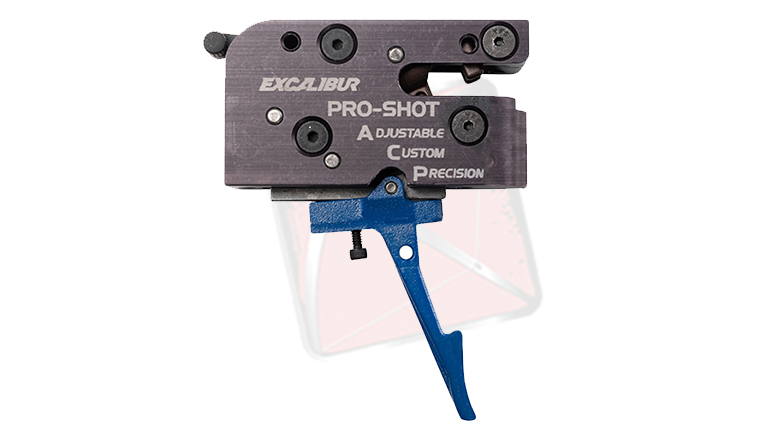 Excalibur brought the heat in 2019 with a slew of amazing new technology into the crossbow market, and the NEW Pro Shot ACP trigger is just one of the many exciting upgrades they have introduced. Historically, crossbow triggers were designed more towards safety; however a two stage adjustable trigger with a rifle-like 3 pound pull is a really appealing upgrade for maintaining accuracy at longer distances. When I first saw a Pro-Shot ACP unit at the 2019 ATA show in Louisville Kentucky, I was pretty impressed with the overall feel and size of the unit. Everything feels real sturdy in the hand, and the size of the unit is pretty much as expected. The pro shot unit will fit into most of Excalibur’s previous crossbow models as well. I even had a chance to play with a see-through model (the same as in the video above) which was nice for seeing and learning how the trigger’s internal mechanisms work. After shooting close to a hundred arrows out of Excalibur’s new Micro 360 Takedown Pro, I really gained an appreciation for this trigger. It truly reminds me of a rifle trigger similar to the one on my deer rifle. I’ve even had a few first time shooters shoot 3 shot groups out of this bow, and they were pounding nails! The problem with crossbow triggers prior to the Pro Shot ACP is that they have a much “harder” or “longer” length of pull, which gives both the bow and shooter more room for error. The Pro-Shot ACP solves that problem. This new trigger comes standard on several of Excalibur’s new bows for this year, such as the Assassin 420 Takedown, the Bulldog 440, and the Micro 360 Takedown Pro. This trigger creep that shooters feel leaves the door open for a lot of error in your shot. Without noticing, a shooter can easily pull that shot left or right, and it’s especially noticeable out past 40 yards. The crisp, light pull of the Pro Shot ACP allows a shooter to hit their mark more frequently than ever before. Lets take a look at the features on this new trigger. Adjustable to either a one or two stage setting. 3lb. trigger pull, with no creep for repeatable and consistent accuracy. Will NOT Void factory warranty if installed into your Excalibur bow. Friction-less Roller Catch Technology keeps grit, grime, and dirt from getting inside the sear and catch. The Pro-Shot ACP Trigger will help anyone shooting it get more consistent, accurate groups at any range, just make sure you’re slowly squeezing the trigger when you’re on target and that you maintain proper shooting form. Ordering a replacement trigger is easy, and so is replacing it. You can find the Pro Shot ACP Trigger here on our website, they sell for $199.99 and would be an excellent choice in upgrading your already spectacular Excalibur crossbow.